Recorded on October 3, 2010. I think this maybe my favorite episode. Kevin Smith Daredevil was pretty freaking awful. Anyone who didn’t read any of the stuff yet – here’s a pretty good link for you – http://www.dccomics.com/media/excerpts/1661_1.pdf “Anatomy Lesson” for free from DC. 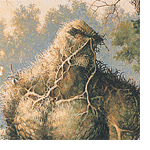 I should read Man-Thing sometime, I can’t remember it at all despite knowing I read a dozen issues. You know what I do remember is a character called Captain Universe that in one issue helps a corpse get revenge. An old comic book store dude told me that he thought the comic that really was the thing that helped make Vertigo possible is Suicide Squad. I haven’t read enough issues to say anything, but I know Shade is sometimes a member & John Ostrander wrote a lot of it, so I should check it out. But I guess if you really want to get into why Vertigo was able to happen, I suppose it might be the death of a bunch of indies (Eclipse, Eternity, Comico, First, etc.) leaving readers wanting that kind of work & other people needing a publisher. If success comes, I’ll make sure “guttertrash.net” is written on my arm with a sharpie before I overdose on narcotics & alcohol. Comixpress theoretically distributes comics to shops POD at a decent rate. Don’t know if Mavericks would be interested in looking into it.